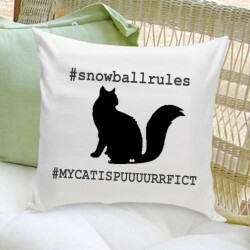 Our Personalized Hashtag Cat Silhouette Throw Pillow is a perfect gift for cat lovers. Customize the..
Our Personalized Script Cat Silhouette Throw Pillow is a perfect gift for cat lovers. Customize the ..
Our "Circle of Love" Pink Silhouette throw pillow is a perfect gift for cat lovers. Customize the im..
Our "Circle of Love" Smokey Blue Silhouette throw pillow is a perfect gift for cat lovers. Customize..